by Jim VanderGiessen Jr, Pro Refrigeration Inc.
Propylene Glycol is a Food Grade Antifreeze. A food grade antifreeze is required when a food product is being cooled. The glycol, mixed with city water, enables us to operate our chiller systems in the 25-27 F temperature range that breweries require. Our recommendation is USP Grade Propylene Glycol. USP (United States Pharmacopeia) is the official standard setting authority for medicines, supplements, and health care products in the United States. Any glycol carrying the USP Grade provides assurance the product is definitely approved for Food Applications and is of the highest quality. here are many inexpensive, low quality, glycol based solutions out there. Some of these, such as RV rated antifreeze, are not designed for a recirculation system and could breakdown quickly causing equipment damage as the result of freezing up or gumming up the heat exchangers in your system. If your system contains Black Iron (Steel), Galvanized, or other ferrous metals, a rust inhibitor will need to be added to your solution. Many customers don’t understand why they need to add so much glycol to their chiller system. They assume that if their chiller system is at +27 F Glycol, the freeze point of the solution only has to be below +27 F. One must remember that the temperature of the refrigerant will be 10 – 15 F below your glycol solution temperature. So if your operating with a +27 Glycol Temperature, your refrigerant temperature is probably +12 to +17 F.
We require the freeze level of your Glycol/Water Solution to be 20-25 F. below your chiller system setpoint. In colder climates, make sure that the glycol freeze level is lower than extreme ambient conditions. We do not require the freeze level to be 20 F. below winter extreme conditions. The average brewery will operate with a 35% Glycol to 65% Water Solution. This will protect from freeze up to +1 F.
It is very important to use the proper percentage of glycol to water in your system. Not enough glycol could lead to the system freezing up and possibly causing your chiller evaporator to rupture internally. Too much glycol will drastically reduce your chiller systems efficiency. I HAVE DETERMINED MY PERCENTAGE, HOW MUCH GLYCOL WILL I NEED FOR MY SYSTEM? You will need to calculate your total system volume. Add the estimated volume of your total system piping, plus your tank jackets, and the reservoir size on your chiller system. Your plumbing contractor and tank manufacturer can help with piping and jacket volume estimates- the chiller system tank capacity should be available from the equipment manufacturer. HOW DO I FIND OUT THE SOLUTION PERCENTAGE (GLYCOL FREEZE POINT) OF AN EXISTING SYSTEM? The easiest way is to use a Refractometer, in fact many breweries and wineries have instruments that will provide a reading in degree brix. Although propylene glycol doesn’t contain sugars, it affects the refractive index in a similar fashion. Most chiller system manufacturers would also be happy to test the freeze point/concentration of solution samples that are sent to them. WHERE DO I PURCHASE GLYCOL FROM? A) A) Pro Refrigeration Inc. is an authorized distributor of Safe-T-Therm Propylene Glycol Heat Transfer Fluid. Safe T Therm is a USP Grade Propylene Glycol Solution that not only contains an orange colored die to help identify leaks in your system, but also rust inhibitors. We can ship the product from any of the seven warehouses located across the country. 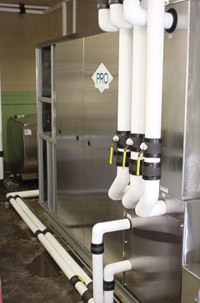 For a quote please call Pro at 800-845-7781, or visit the website at www.prochiller.com. Notes: Dow also manufactures a product with rust inhibitors. WHAT TYPE OF PIPING MATERIAL SHOULD BE USED FOR MY GLYCOL PIPING? Recently there has been a lot of debate on the subject of PVC Glycol Piping. Until there is more information available, Pro is going to strongly encourage all of our customers to chose either Copper or ABS Piping for their glycol cooling loops. We understand there are literally thousands of installations that have utilized PVC, many without any issues. But with the recent reports of some catastrophic failures of PVC piping systems, discussions with a PVC manufacturer and with an installation contractor, we feel this is definitely justified. We are currently limiting our recommendation for glycol piping to two options; Copper Tubing or ABS Piping. Copper Pipe should be a first option for your glycol loop. Although materials and installation will be higher than PVC Pipe, when correctly installed you will receive years of trouble free service. Consult with your plumbing contractor to insure your piping is correctly sized, undersized piping will cause increased Glycol Line pressures, possibly jeopardizing your tank cooling jackets. ABS Piping is very similar to PVC. The benefit of the ABS Piping System is the rating to operate between -20 F and 110 F. It is more expensive than PVC, but significantly less than copper and also easier to install and repair. ABS can be purchased with or without the Insulation. The Pre Insulated Piping Option is quickly becoming one of the most common choices for new breweries in the United States. It is not hard to justify the investment of the Cool-Fit Piping System. A complete pre-insulated plastic pipe system designed specifically for low temperature glycol systems. This product requires little to no maintenance with a designed service life span of 25 years. Please visit www.cool-fit.georgefischer.com for more information. It is highly recommended that a Y-Strainer be installed on your glycol system. HOW SHOULD MY GLYCOL LINES BE INSTALLED? 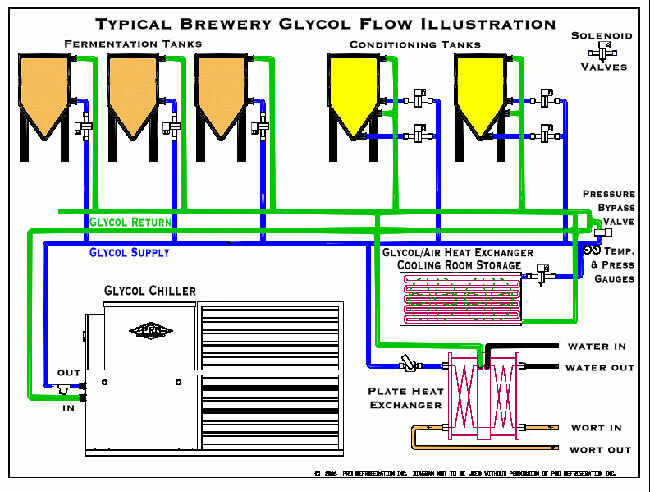 Several factors should be considered when designing and laying out your glycol piping. 1. Set your chiller system as close to vessels as possible. You want the least amount of restriction as possible between the chiller system and vessels. 2. Be careful not to use too many pipe fittings or undersize the piping. Undersized piping and fittings will cause increased Glycol Line pressures, possibly jeopardizing your tank cooling jackets. 3. Use the “FIRST IN / LAST OUT” Piping method for your Fermenters. The FIRST Tank to be supplied with Glycol from your SUPPLY Header, should be the LAST Tank connected to your RETURN Header. Please see illustration below. This helps balance the system flow, ensuring equal flow distribution to each vessel connected to your system. 4. Install pressure (0-50 lb.) and temperature (0-50F.) gauges in the SUPPLY header. Place them in a high visibility location. These gauges can alert you to a cooling system problem and / or a pressure problem. 5. Although most brewery designed chiller systems are supplied with an internal Pressure Bypass Valve on the Supply Line, installing an additional one at the end of your SUPPLY header is recommended. These adjustable valves will bypass flow from your supply header to your return header, protecting your tank cooling jackets from over pressurization. 6. Each Fermenter should have a dedicated chilled water solenoid valve controlled by a temperature control that senses the product temperature. When your product temperature drops to the set point temperature the solenoid valve will close shutting off the flow of glycol. It is a good idea to install a manual bypass around each solenoid valve. This manual bypass will allow the ability to cool each vessel in the event of a temperature control failure or solenoid coil burn out.